I promise that I will take more step by step pictures and put them in this post later. A while back Ale 8 was on a big sale. If you aren’t from Kentucky you probably don’t know what Ale 8 is; it is a locally made and bottled soda that is basically the lightly carbonated nectar of the gods (unless you are getting it from a soda fountain….don’t get it from a soda fountain). Anyway, as I was drinking this deliciousness from a lovely shiny, green glass bottle I was struck with inspiration. Such awesome bottles should not be put to waste. 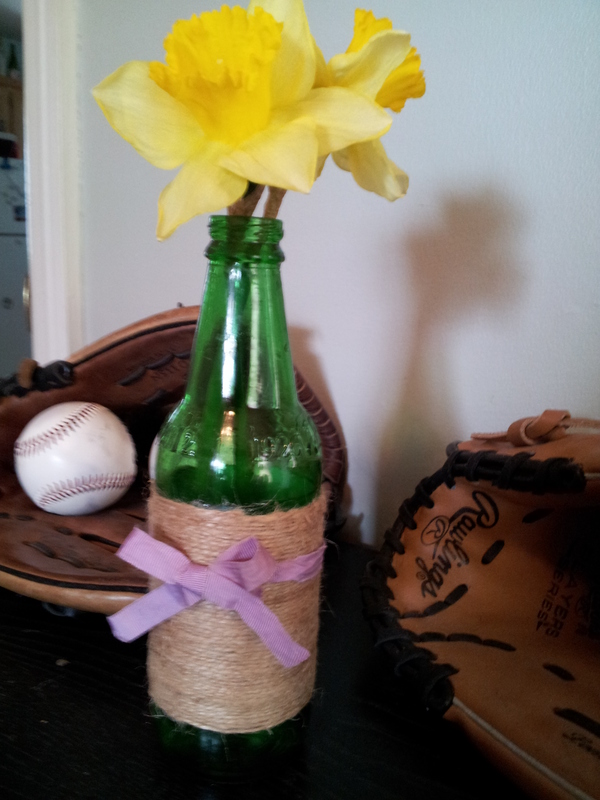 Lately I have been turning them into really cool vases. It’s quite simple really. All you need is: a hot glue gun, mod podge, and whatever you want to glue to it. I use twine and ribbon. 1. First you will want to start whatever it is you are gluing to the outside with hot glue to give it a strong anchor that will hold it there during the wrapping process to follow. If you are using something wide enough you can continue on with the hot glue. But for me, I usually use twine. Twine + hot glue = a string hot mess. 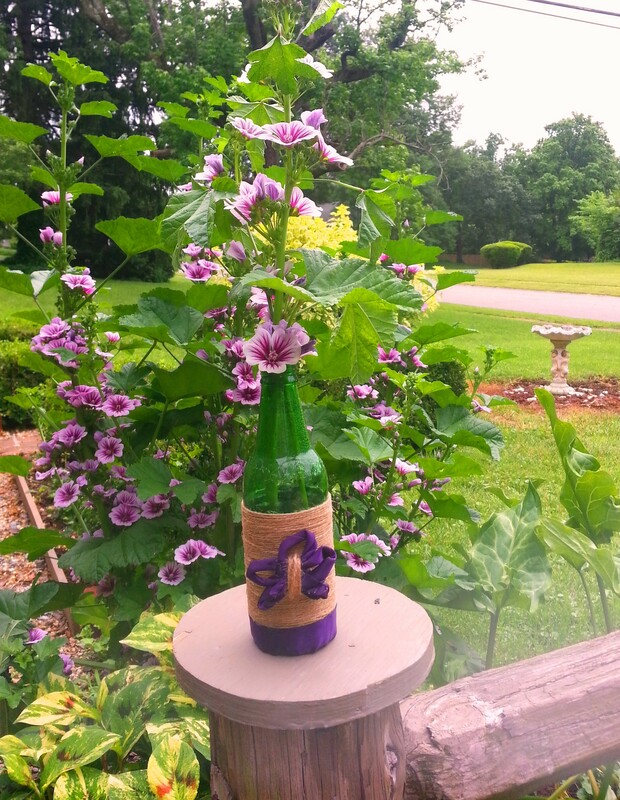 So what I do is anchor the end of the piece of twine with the hot glue and then glue the rest down by spreading mod podge all over the bottle and tightly wrapping the twine around. Then I secure the other end with hot glue as well. Here is the one that I gave The Moms for Mother’s Day. No worries, I am not blowing a surprise. We celebrated when I was out there last week. You’ll notice the twine goes all the way up on this one. 2. 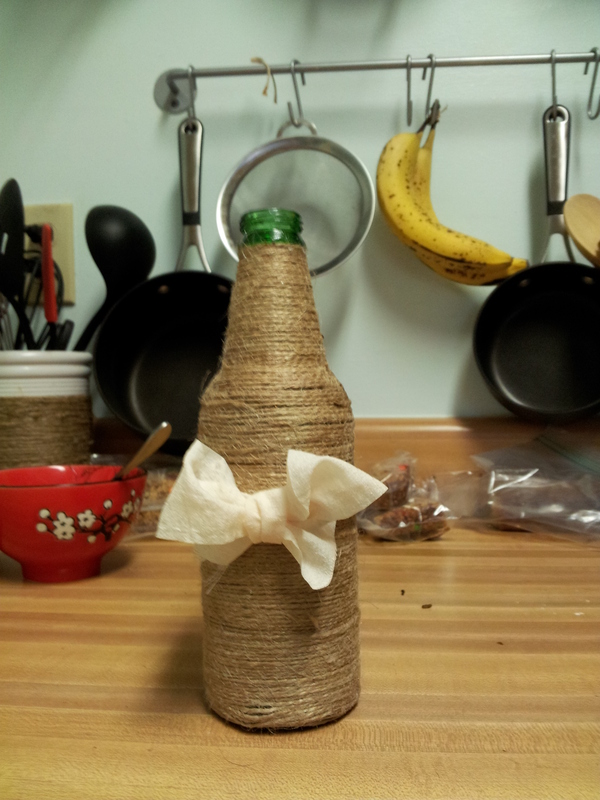 Now, it is really up to your own artistic flair how you choose to do this, but for me I like to put twine around all or part of the bottle and then embellish it with some other ribbons. The ribbons I use hot glue for to ensure that they stay put. 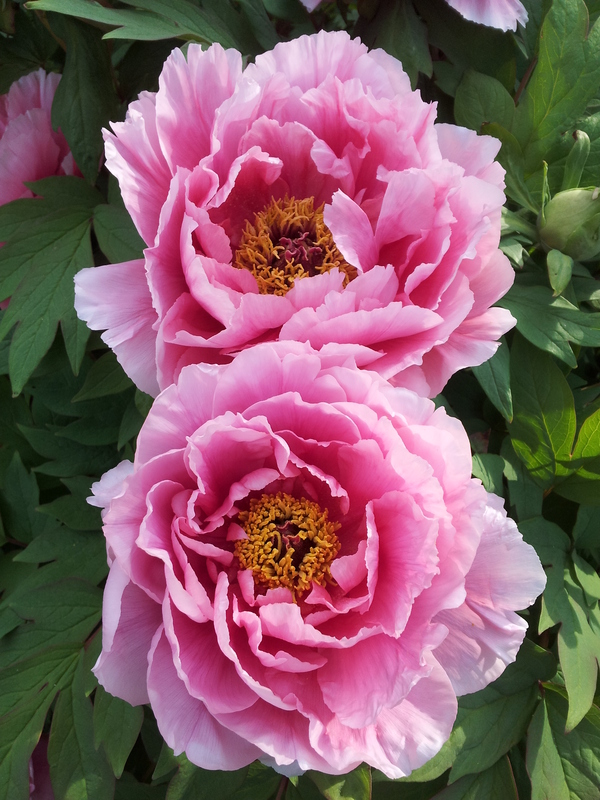 It’s not a big vase, but it is big enough for one or two beautiful spring blooms like these ones in our yard, which is usually all it takes to really brighten up a space. 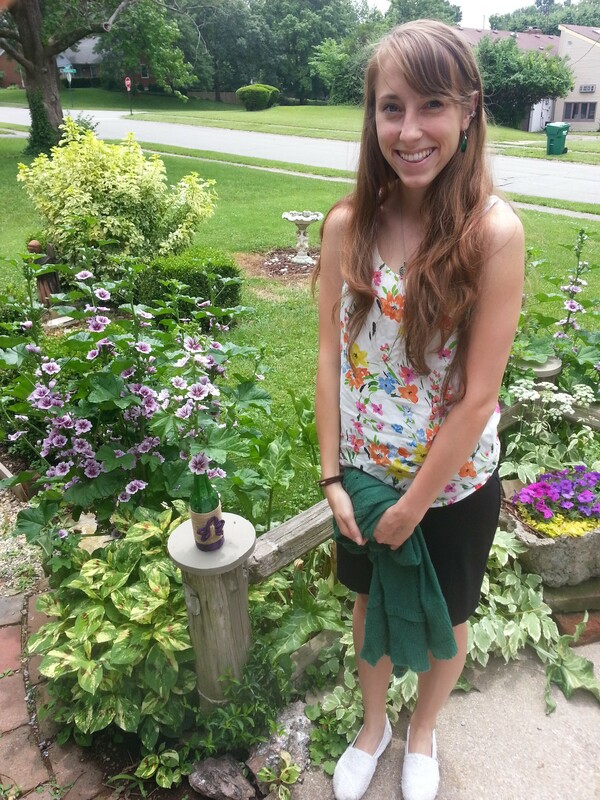 These are the flowers that we put into another one I made and gave to our landlord on May day. He is the sweetest old man! You may remember my stories about him from this post last fall. When we took our rent check to our landlord, he brought out the vase I gave him last month with a flower from his garden in it. He is so precious! He wanted “an arty person’s opinion” on his arrangement. AND he had Will and I take pictures of the vase. He is just so tickled by something so simple. It’s the simple things in life. Here is the one that I made for him. He is really proud of it.